The consensus at the press conference was that the circulated letter was the true one, and a cursory glance at the first page of the copy with Minister Samarasinghe suggested that this was the case. However, two days later, a Sunday newspaper produced the correct version, and also highlighted the differences between this and the copy circulated by email. 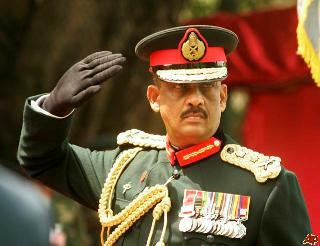 The thrust of the article was that what had happened suggested that Gen Fonseka was an unreliable ally, and pains were taken to suggest that he would not be in favour of media freedom. Indeed the article seemed to suggest that many of the criticisms made earlier of the government with regard to this issue arose from Gen Fonseka’s approach. It also highlighted some of the reasons the General had given as to his concern for the IDPs, namely that that the government was resettling quickly because it did not want to incur expenditure on them. While arguing that demining and the provision of infrastructure were inadequate at present, he stressed that he wanted more troops to ensure security, and that there had been insufficient checking thus far to confirm the identity of possible infiltrated terrorists amongst the displaced. The impression the article created was that Gen Fonseka wanted the IDPs kept on in the camps, with enhanced security measures. All this is characteristic of the General as he presented himself to the public in the past, and suggests that he at least is an honest man. It is also not surprising that some of his ideas are at variance with those of his possible allies, and the arguments that will have to be used to overcome gross inconsistencies will surely prove most entertaining in the weeks ahead, if the proposed alliances go through. What is surprising however is the emphasis on the discrepancies in a paper that seemed triumphant the previous week in asserting that the alliance had been sealed. The impression this article creates is that there are some doubts in the UNP, and in particular its leadership, about the alliance. Perhaps the strategy earlier of the party was to exacerbate differences between Gen Fonseka and the President and persuade him to run as a third party candidate. When it became clear that he was not prepared to sacrifice himself in that way, the idea then sold to them by increasingly independent strategists was that he would become essentially a standard bearer for their policies. By changing the letter so dramatically, the General showed that he had no intention of becoming a puppet, and that he still wanted to ensure the primacy of his own approach to politics. This is entirely understandable, and that is why I was surprised at the claim in the article that the initially leaked document had been agreed upon. I cannot for a moment conceive of the General freely agreeing to some elements in the original document, and I can also see why he needed to stress other elements if he is to put himself forward as a serious Presidential candidate running on his security credentials. That is why the media finds the passive voice so useful. It would be interesting however to find out who had agreed upon the first document. The suggestion later that the text had been prepared in consultation with the Opposition parties also seems misleading, in that the text seems rather prepared by those Opposition parties to satisfy their own requirement of common ground. Thus they gave their sop to Cerberus by concentrating initially on the General’s personal grievances, but planned to end with a flourish by emphasizing areas on which they could agree, and which they assumed would be electorally popular. Obviously the UNP and the JVP could find common ground now, institutional memories being so short, on the need to protect the media and fight corruption and reduce the cost of living. But since victory also needed the total support of the minorities, the plight of the IDPs had to be highlighted. Since, contrary to earlier critiques, resettlement was proceeding apace, the joint Opposition draft stressed the need for freedom of movement for those still within the Centres. Sadly for them General Fonseka turned that on its head, ignoring that point and instead raising objections to swift resettlement, and in particular security concerns. I find it difficult to believe that the General was hypocritical enough to agree to the original draft and then renege on this agreement. Rather, if the newspaper article was in any sense accurate, it would seem that those negotiating on his behalf agreed on a text that was inspired by what might be termed joint opposition concerns. He then refused to be party to subterfuges that made a nonsense of concerns he had raised previously. Perhaps by now the concerns raised by the article have been settled, and we will have more joint opposition statements that will take in the international community while also winning votes. But I suspect there will be many more intriguing letters and dissonant declarations before this confusing game draws to a conclusion.